It has been a week full of intensity, as per usual. It seems like the news has become a little like that, or perhaps it is what we choose to consume... Here are a five videos that popped up on my radar this week that are definitely worth your time. 1. Jon Oliver on Drones. This guy is a gift. Takes issues once a week, tears it apart in 15 minutes or so. Sometimes, he can say things that others have been saying for ages but because of who he is, it is better received. Yes, that may be frustrating, but who said life was fair? Either way, his stuff is worth watching, and this week just highlights how ridiculous and insane the United State's Drone policy (or lack thereof) is. Skip the first part of the video and wait until you get to the part where Reza Aslan starts talking. This guy is a religious scholar and academic. He knows his stuff, and the way that he clearly articulates things many Muslims yell at the TV while watching (or avoiding) CNN is brilliant. 3. Ernesto Sirolli: Want to help someone? Shut up and listen! A lesson that my father taught me over and over. Why projects keep failing in 'Africa'. It can't be a Yassmin video wrap up without some Afrobeats... Let's have something light to finish off why don't we? I sighed. How to explain the love of football, especially that of the World Cup? I can’t pinpoint exactly where my love of the World Game begun. My earliest memory is that of the 1994 games. Although I don’t remember the details, I do recall being left in front of the TV with instructions to call my dad over whenever a goal was scored. Given that I was only three, I wasn’t sure what a goal was exactly but I made a deduction that it had something to do with the reactions of people in the stand. So, anytime the stadium cheered I would rush to get my father, guessing something important had happened. Looking back, I am not sure my father thought the strategy was as impressive as I thought it was. My obsession after that only grew, despite the fact that everyone else in my family only cared slightly. I stuck posters with match timetable and draw on the lounge room walls. I made scrapbooks for the tournament, writing little notes about each match and cutting out all the pictures from the paper, decimating my father’s newspaper-reading ritual in the process. In 2006, I watched every single game until my mother banned me for a night and demanded that I go to bed. Apparently a straight week without sleep was enough to make my mood positively dangerous, particularly when my team was floundering. 2010 brought the World Game to my screen right in the middle of my most difficult university exam period, and perhaps may explain the grades I received that semester. 2014, even with a full time job and despicable game times in Australia, has been no different. The question, however, remains. Why, as my friend asked, do I care so much when Australia always does poorly and my land of birth, Sudan, has never made an appearance? Why do I feel so impassioned about the fate of a team when, ultimately, it has no bearing on me? I am no footballer – anyone who has seen me with a ball at my feet will confirm that – so it has nothing to do with being inspired to play better. And in the weeks of the World Cup, it is much more than ‘just a sport’ for billions of people around the world including me. Football, it seems, has its own type of magic. It is the most popular game in the world, played on streets in every nation. It requires no gear apart from an object that is roughly round (in Sudan we used balls made out of old socks) and markings in the ground to delineate a goal. Money, pedigree and social standing have no bearing on your ability to be a great player and perhaps even make a name for yourself. It is simple to understand, and its barrier to entry is extremely low. Anyone can play and be a part of the beauty of this game. This game is so much more than statistics. Football is ultimately about humanity. The World Cup is a tournament that brings grown men to tears, changes the lives of rookie players and inspires generations of children to do something great. Some countries grind to a halt to watch the games. The green is a battlefield where literally anything can happen – great teams kicked out at the group stages, underdogs (like Greece and Costa Rica this year) making it further than anyone thought they could goalies and strikers alike making the impossible real. Goals can be scored right up until the last second, changing fates and creating heroes. Infamous moments are revisited for decades; Madonna’s hand of God, Zidane’s headbutt, that-one-English-win-in-1966. Football is the great equaliser. Yet, the World Cup is also a tournament that unites in defeat. 31 of the 32 teams that travel to Brazil this year will experience it in some form, whether it is crushing, like that of Spain, or hopeful, like Australia’s defeat against the Dutch. 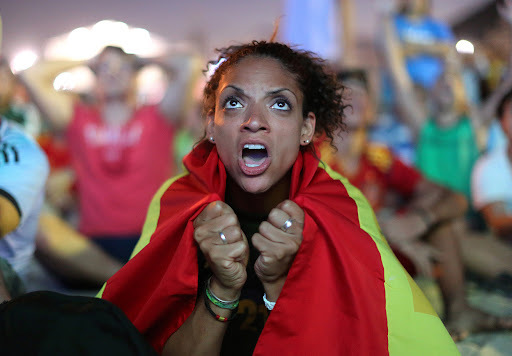 If there is one emotion we can all share, it is the commonality of World Cup heartbreak. Scottish footballer and former manager of English club Liverpool, Bill Shankly, said it all for me. The map is being redrawn, in blood. It is impossible now to believe that Syria and Iraq will ever be reconstituted as the states that they were. The map of the Middle East is being redrawn, and it is covered in blood. I don't usually agree with the man, but Sheridan's article is worth the read. It raises many a salient point, and the crux of it is this: times are changing. What is happening in the Middle East is not the result of any one action or event, although some contributed more than others. The invasion of Iraq in 2003 was not great for the region's stability, but the blame does not lie solely there. Nouri al-Maliki, the installed Prime Minister of Iraq for example, had plenty of opportunity to bring the various religious sects together in some manner but failed to do so effectively. Yet, this again isn't the only factor. Alas, the lessons of history. What is happening in the Middle East is not due to a recent phenomenon. In our conversations around the causes, the effects of the first gulf war are often omitted. More importantly, the lay of the land pre the World Wars are ignored. This is the map of the Middle East in 1914. This is the rough map of the region now. I can claim no superior knowledge of the region and am no historian, political scientist or expert of any sort. However, the argument can be made that the construct of the 'state' as we know it is an unnatural relic of the colonial era. Sudan, my country of birth, is a classic example. Straight lines make (or made) our borders. Tribes that make up nations follow the land, not straight lines! Boundaries were drawn through tribes, and land was divided up by colonisers in ways that suited their ends. The 'states' as we know them today aren't necessarily a true reflection of the allegiances within the nation. This was brought to my attention most keenly last summer when I asked a cousin why they weren't fighting to free Sudan from the current dictator. "Why should I care about what happens to Sudan? What has Sudan done for me? If I want to be taken care of, in health, education, resources, anything, I turn to my tribe. Sudan as a country is useless..."
The hope that it may lead to something better is simply a reaction. My reaction; a scrambling attempt to see some good and benefit in a situation that is so brutal, callous, violent and cruel that my mind can barely comprehend it. How we as humans are capable of such is beyond me. Yet, for a generation that has been brought up on bloodshed, how can we expect any different? Madiba! A lament, a celebration. Tears for a man who inspired us all. Nelson Mandela passed away today, at the age of 95. There aren't many other figures in recent history who have inspired us Africans in the same way, and sacrificed so much for his people with such humility. This is a piece I wrote a little while back but never published...now is perhaps a fitting time. The world is an emptier place without Madiba. He is one of the great men in modern history, one of the true statesmen that have graced us with their wisdom. I am not South African myself, but I feel a kinship to the man who gave up 27 years of his life in a prison to fight a cause for his people. When he was released, he somehow was able to also then forgive the very people that locked him away. I may not be South African but as a fellow African, Mandela (or Madiba as he is known to his countrymen), is like my very own grandfather. It is a sentiment I think shared by most, if not all Africans who have grown up or witnessed his immeasurable sacrifice and influence on South Africa and on the continent. My family originates from the Horn of the continent; having been born in Sudan and flavoured with Egyptian and Moroccan blood, I am thoroughly north African. As with all African nations (bar one! ), the effects of colonisation was keenly felt in Sudan. Interestingly, the effects of their departure and the legacy that they left still remain. Sudan was conquered by the British, and in an effort to move on the current regime did everything they could to establish an 'anti-British' and ultimately 'anti-colonial' environment. This included reverting the education system to Arabic and implementing a strange version of Sharia Law that only applies when they see fit. In an attempt to find their own identity and cast of their colonial shackles, the nation has shackled itself to static ideologies and a fear of the 'other'. Sudan isn't unique in this situation. Every nation has it's own story of post colonial struggle and the fight to define their national identity. Madiba is a shining beacon of light in this darkness of confusion that African nations have sometimes found themselves in. He, after all, is the man who fought the good fight for his people against the oppressors. He, after all, is the man who won that fight. Most importantly, he remained true and uncorrupted and has stood for democracy and truth steadfastly and with conviction. “It always seems impossible until it's done.” he said. At the time, the end of apartheid did seem so. Yet here we are today. It is difficult to put into words the importance that Nelson Mandela has in South Africa and around the continent. The monarch-like love for him, the deep caring the people have for their leader is unparalleled and very difficult to replace. Perhaps it is a blessing in disguise for all that we have been made aware of his illness and frailty, in order to prepare us for the eventual truth. This way, the people are mentally preparing themselves and are thinking about the preservation of his legacy. At the end of the day, all the love won't be enough if his legacy is lost. To honour his work and his life, we should all remember his words and his actions and aspire to work together and build a continent he would be proud of. "I am here because of people like him" - Zola, a friend and South African sister. Indeed we are, and we owe much to his legacy. Read The Guardian's obituary here. Morning morning morning! I hope your Friday is going well! TGIF indeed...here are five bits of interesting facts for your Friday. I adore this idea - quotes in comics. Zen Pencils, it's called. This is the first comic I read, and it struck a chord it did! A fan even made a short video of it. Long read for the day: Slow Ideas, on the New Yorker. In our era of electronic communications, we’ve come to expect that important innovations will spread quickly. Plenty do: think of in-vitro fertilization, genomics, and communications technologies themselves. But there’s an equally long list of vital innovations that have failed to catch on. The puzzle is why. So tell me. What are some interesting things you've come across on the net?